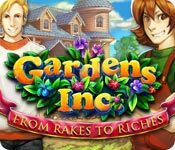 Gardens Inc.: From Rakes to Riches is rated 4.3 out of 5 by 95. Rated 5 out of 5 by mrm2006 from Save Your Grandparents' Home!!!!! You need to help save your grandparents' home from the evil, dastardly man who wants $1 million within a short period of time and the ONLY way to get it is to win the town's gardening contest. You, who know nothing about gardening, sets out to learn by becoming employed by a gardening company and then, as you become more confident in your work, enjoin a friend and form your own company. Can you save your grandparents' home? 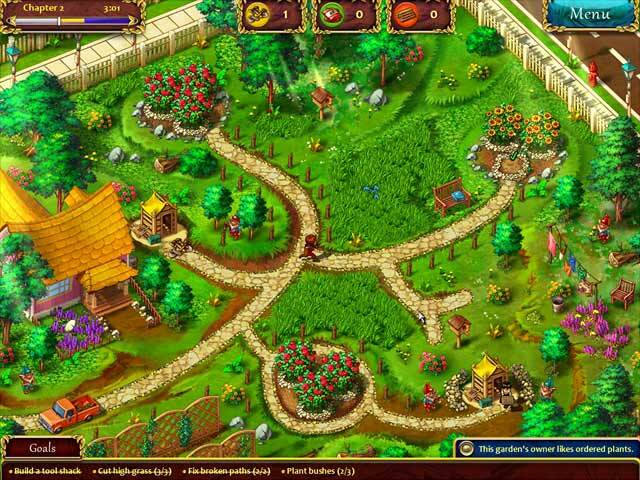 Can you become the gardener you need to be to win that money? Only time and this game will tell. I LOVE, LOVE, LOVE this game. A building game has to be really special for me to even like it, much less purchase it. I don't know if it was all the pretty flowers and making gardens and parks so beautiful, but I absolutely fell in love with this game and have to have it. Yes, yes, it's timed and I HATE timed games (like time management games) but this game has me so hooked (line and sinker too) and I don't really know why. 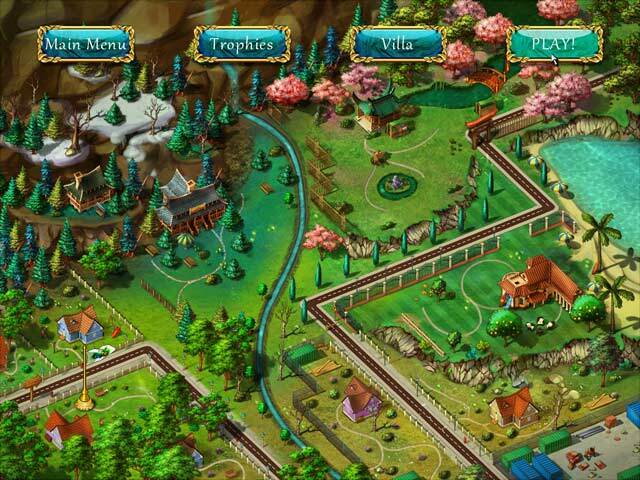 You level your way up by upgrading gardens, parks, etc. picking up tools, seeds, building sheds, etc. and planting plants, bushes, etc. and get bonus points by following the special goal (for instance, this client likes their flowers all in the same color groups). The better you do, the more money you make and you upgrade your grandparents' place - which costs a bundle! If you like flowers, gardens and solving a mystery (oh yeah, there's that too) and don't mind time management games too much, you HAVE to try this game. The free hour demo went by soooooo fast. Happy Gaming! Rated 5 out of 5 by wendy555 from So Fun! I loved this game! I finished it and turned right around and started it again. Glad I bought it and will buy the the other one like it. I like how it can be timed or not. Buy it! Rated 5 out of 5 by ElementYaya from Great game! I really enjoyed playing this game. Though I wish there had been voices put to the characters during the story line...that would have made it that much better. I do wish there was a little more to the story line but maybe it will be better in the next one. At least I'm hoping there will be a next one. It was a very fun game to play and I never wanted to stop lol. Rated 5 out of 5 by Books_Garden from Very Challenging Time and Strategy Game - Loved It! This is a great game, and more challenging than any other TM I've played so far. I would love to get another game like this. When I've recovered from this one! You have to pay attention to the clues, and use strategy to make the most of your time and resources. I achieved gold on every level, but it wasn't at all easy and took several runs and restarts on most levels to get gold. I did have to resort to a walk through, or had to search the forum for hints for several levels, especially before I realized that a straight line wasn't always the best idea, and that you did not have to complete each apparent task. You do have to pay attention to the goals. Experience helps, and the challenge builds nicely with each level. I see that there are a lot of complaints about tech issues or glitches, but you can work around them and it just adds to the challenge. I had a lot of entertainment hours for the cost of this game! Great value. Rated 5 out of 5 by whitepegasus from another game you must have! 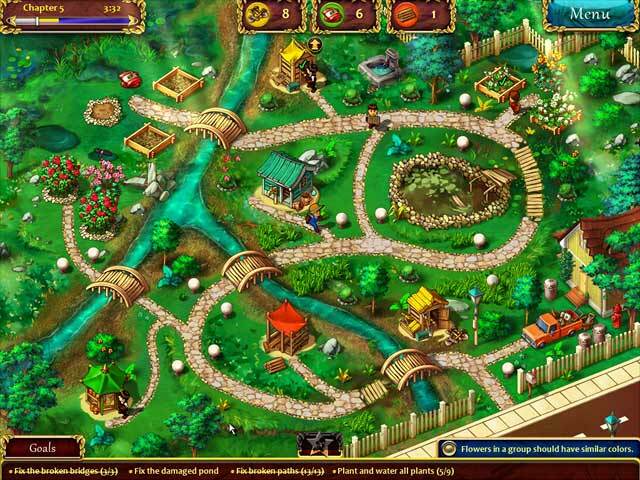 The only flaw I could find in the game is that I'm missing Gardens Inc. I, II ..... I'd love to have more of it! Besides I really like games, that are for the whole family and still need your skills. I keep looking for the follow up game. It's not too easy, I could not solve everything in the gold level at once, but you'll find the solutions if you keep trying. Rated 5 out of 5 by Selkie2283 from An Excellent Game! This is a fantastic game in the style of My Kingdom For A Princess, where you send your little workers all over the map chopping down wood, building bridges, collecting resources, etc. This was a really great take on this kind of game. The game play is challenging, but not too hard if you're trying to get gold ranking on all levels. The sounds of the games are nice, and on some levels, the water sounds were actually quite relaxing. I don't usually pay all that much attention to the storyline, but I thought this one was relatively interesting, and I was curious to see how things turned out. Excellent game! I would definitely buy a sequel!